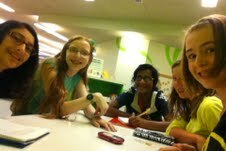 At today’s meeting we went to the library to research things for our project. We had already decided on our storm, but wanted to know more about it. During the time we were there we looked up information about our storm, and researched possible places that could be our community. We split up the work so that we could get as much done as possible in the time we had. It was fun, and we all learned a lot of things.